Well back at Easter Kevin came up and we played For King and Parliament – trying out the rules with the supplied scenario. It worked pretty well, we found no problems with the rules and they were easy to pick up, needless to say I won!! Above my troops advance on Kevin trying to hold the hill. 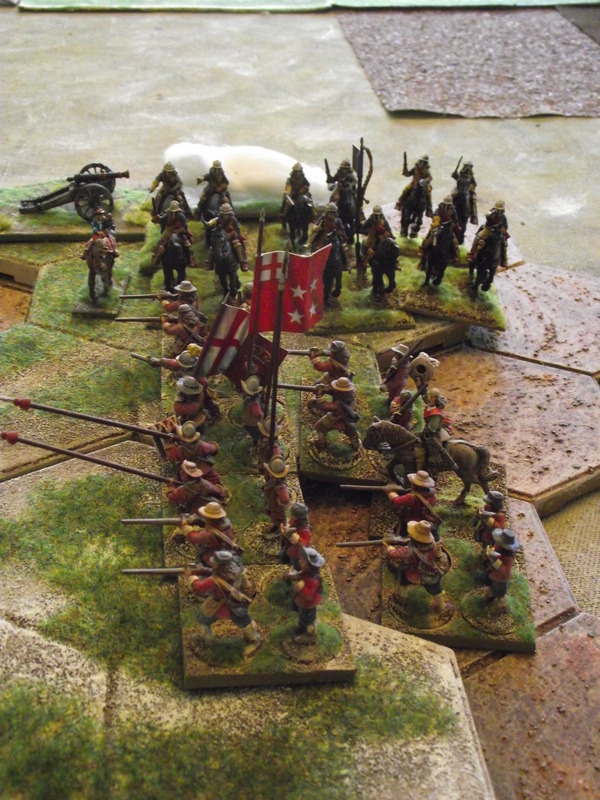 The tussle on the hill went backwards and forward between the rival infantry regiments, until my cavalry, having pushed Kevin’s cavalry off the table swung round and crashed into his infantry on the hill. Victory is mine!!! 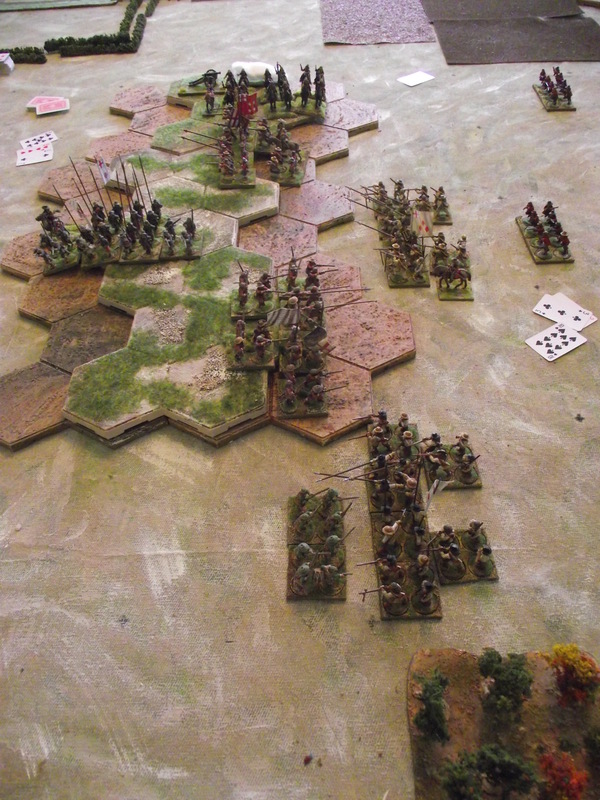 Anyway a close fought game, which was fun and over and done with in a session. 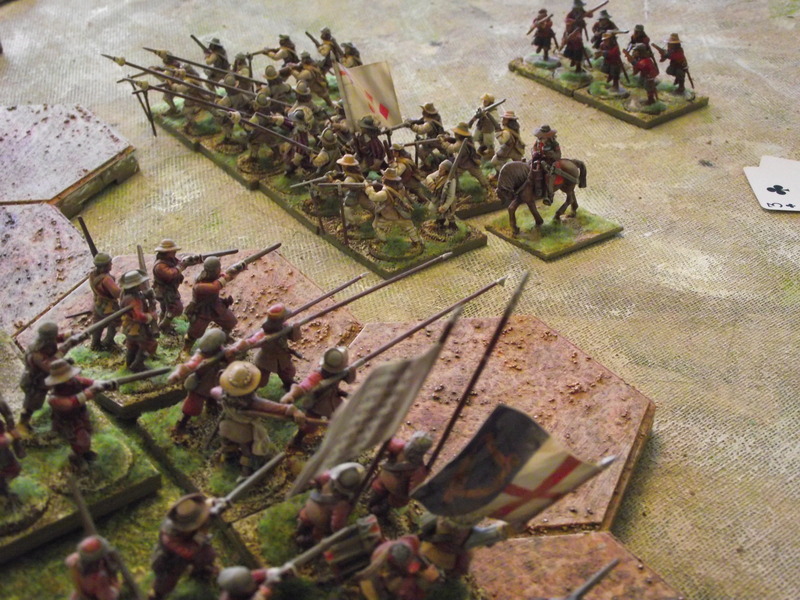 We will play more, emphasis is obviously on good game then historical anorak level accuracy – but I thought it gave a good idea of my interpretation of a ECW battle. 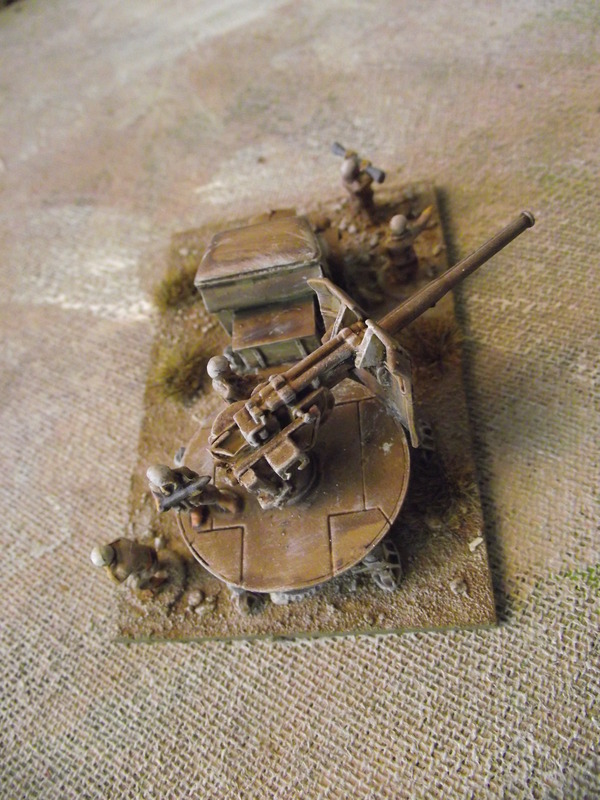 This is a Battlefront (FOW) 15mm Italian ported 90mm AA gun, used as an A/T gun in the Western Desert. Its huge, but lovely – I have another one to make/paint. When I do it will the most potent weapon on the battlefield – Imagine that – the Italians with the best weapon. 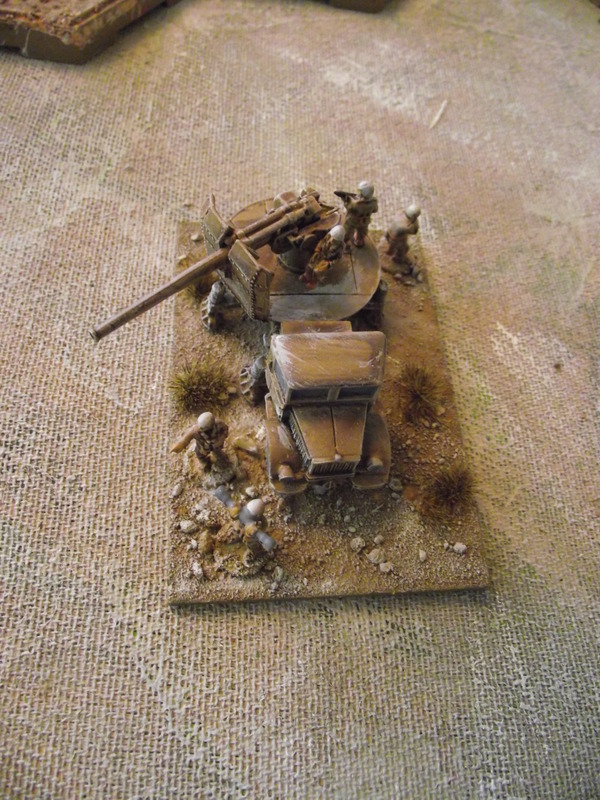 Italian Battlefront (FOW) 15mm 75mm Field Artillery – again lovely figures. I love the really big Italian vehicles – these are not a scale problem – these vehicles really were big – made for the conditions. 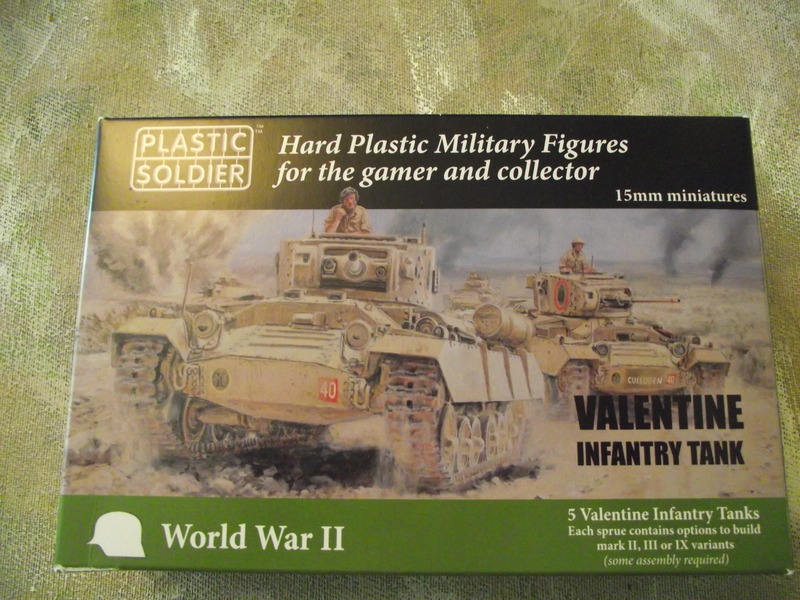 I bought the new Battlegroup Theatre supplement – Torch, effectively part 2 of the Africa theatre which includes the Americans and the Free French. There are some superb photos in it, one of a German column passing Rommel, and most of them are in captured American half-tracks. 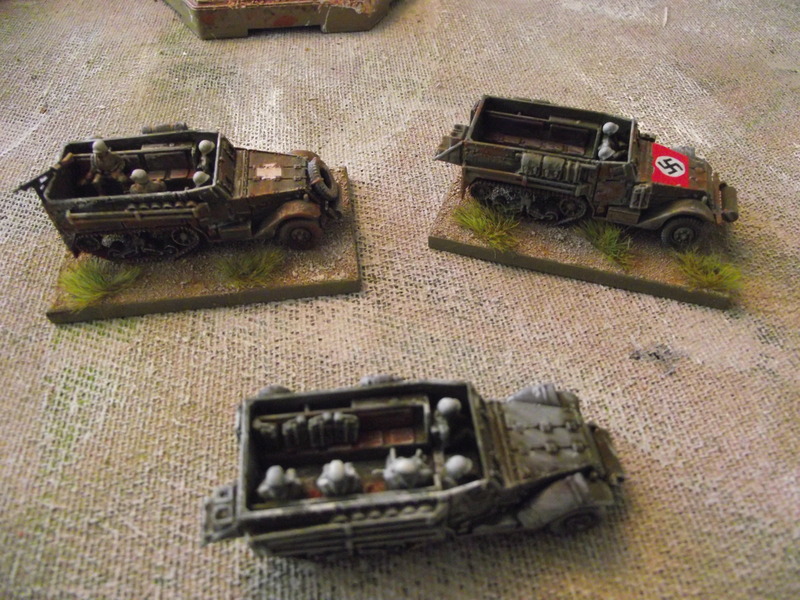 I took this as an idea and got some PSC 15mm half-tracks and populated them with Germans and German stowage (from the German half track pack) – hey presto – more transport! 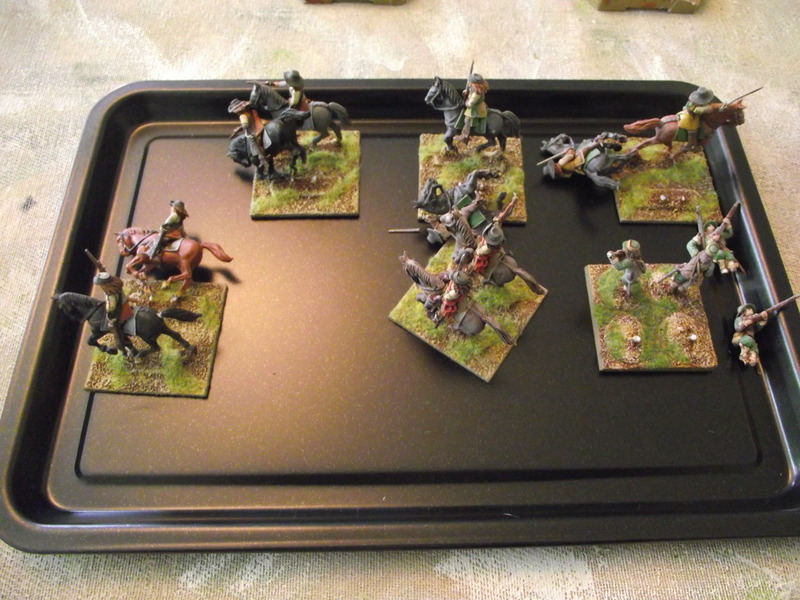 15mm scale figures. 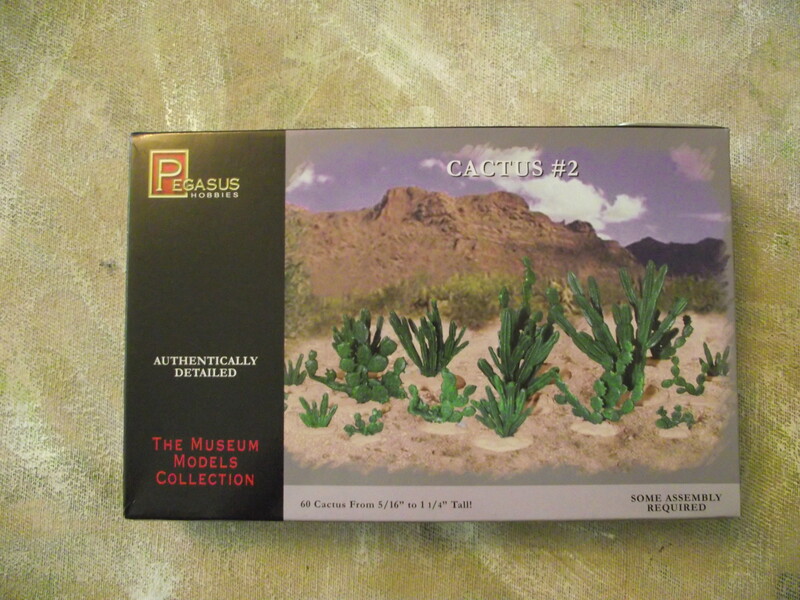 I have enough ‘cactus’ to make another 4 of these, which should be enough. 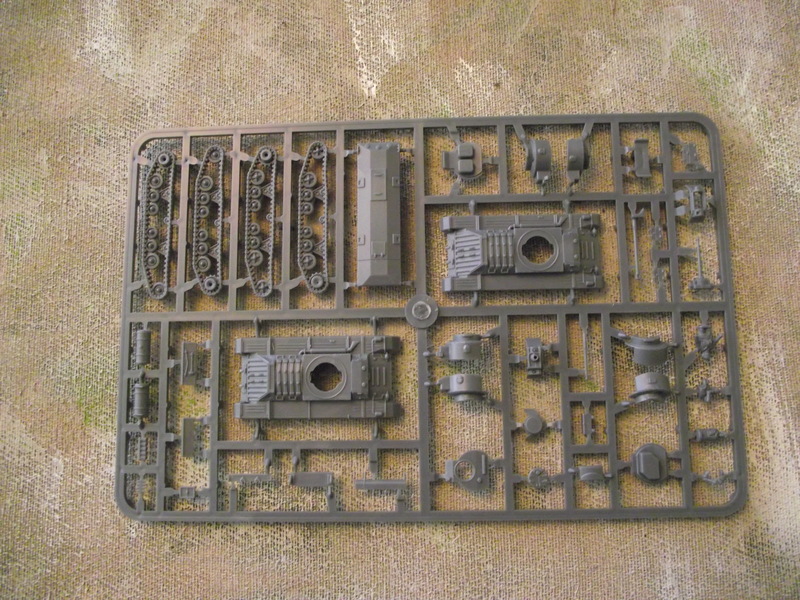 On a cursory glance I reckon I can make 2 tanks out of each sprue, making a total of ten tanks for the price of five! It looks to me that there are three pieces used in each mark – the underside structure piece and two end pieces. 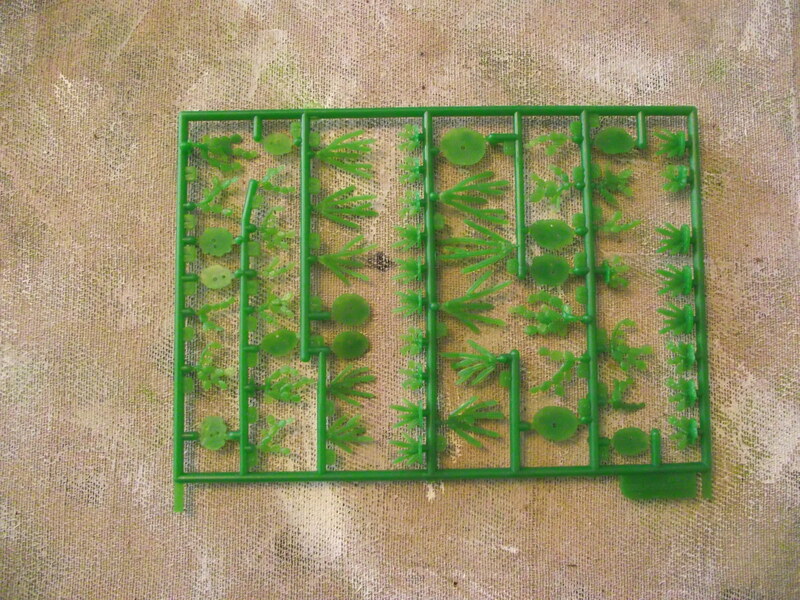 The underside piece is not required for the tracks, and the two end pieces can be replicated with plasticard. I’ll let you know how I get on!! 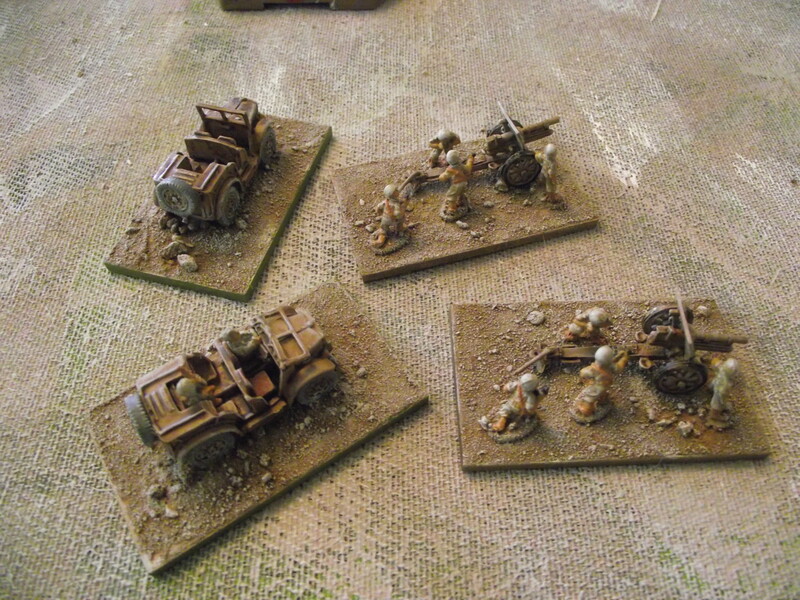 For Battlegroup I don’t actually need ten tanks, so maybe a further conversion will be required (i.e a rescue/repair vehicle would be handy). Last Wednesday, at about 2am, a fox chased one of our cats through the cat flap, beat the cat up and then completely trashed the house as we tried to get the damn thing out. 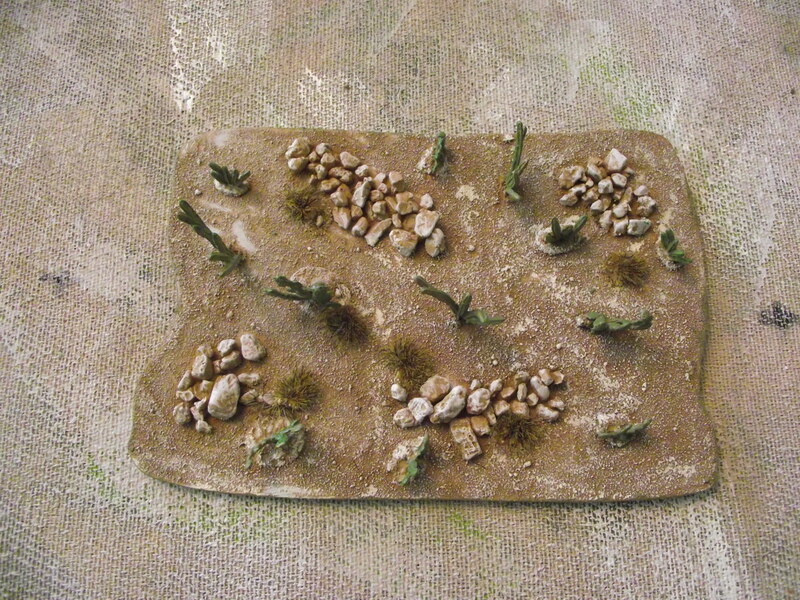 It went into my games room, where my 28mm ECW were still out on the table. It proceeded to trample, stamp, knock and break those figures as it tried to climb the walls and jump out the windows. I couldn’t believe what I was seeing! 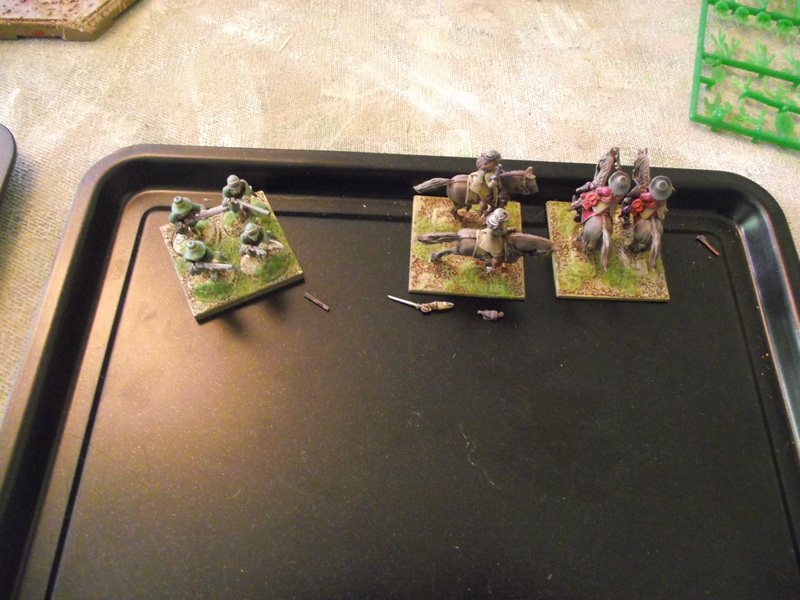 6 bases with broken at the ankles figures. 3 bases with broken guns/swords. Seeing the fox literally knocking the figures flying all over the place I guess the dead and injured are comparatively light. I shall now see if I can find some glue which will fix them. I never in a month of Sundays thought I would get a fox attack on my figures!! Well, almost caught up. Apart from one last thing. 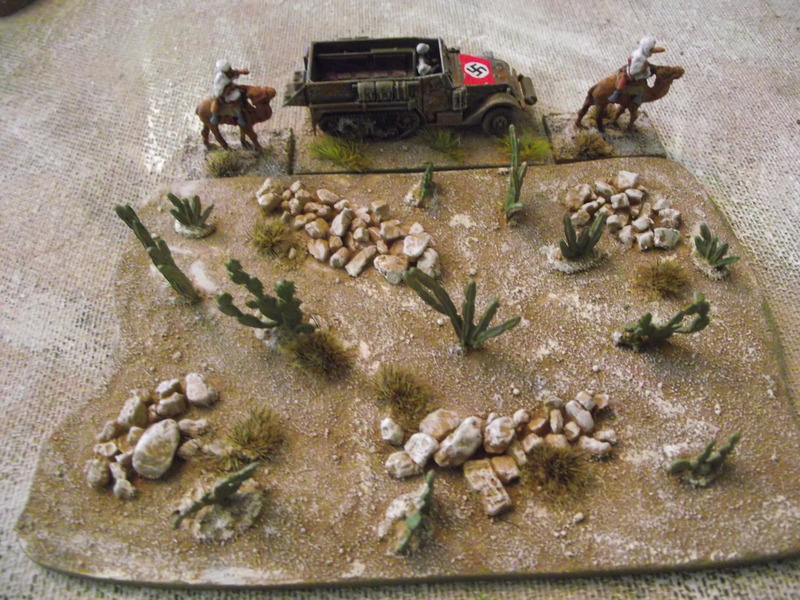 I have started writing a set of WW2 operational level rules, working title ‘Kesselschlacht’. This is very much a reaction, an angry reaction, at the dire ‘Rommel’ set of rules by Sam Mustafa, which at £30 are £29 over priced. I am really enjoying it. I cannot remember when I last wrote a set of rules, rather than designed a game. I have the main mechanisms sorted out, and now need to dive a little into TOE’s and operational examples to hold a mirror up to my assumptions. After that I might have a workable, and in my view, a decent set of rules to play test and tweak. Then maybe, just maybe I might publish. Watch this space.